The Quick Menu can be easily accessed from the Live View screen by right clicking on the mouse. It contains several options to customize and configure your Zosi DVR. Single View – View the selected channel in full screen. 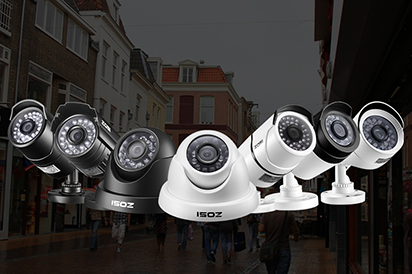 PTZ – Control your PTZ cameras. Start Scan – Select to automatically cycle through the DVR’s channels. Set the interval options in the Main Menu > Live > Main Monitor menu. Colour – Select this option to be taken to a Live View of the selected channel and reveal the Colour options. Select your channel from the drop down menu, and adjust the Brightness, Hue, Saturation, Contrast or Sharpness of the image using the menu. Increase the values by left clicking on the + sign, and decrease the value by clicking on the the – sign. You can always restore default settings by pressing the Default button at the bottom of the menu. Please confirm any changes by left-clicking on the Save button. 6. E-Zoom – Select this option to digitally zoom in on portions of your screen. Select between 4x and 8x zoom, and left click with the mouse to zoom in where you click. Left click once more to return to your original view. Right click to go back to the previous screen. 8. Snap – Select this option to take a screenshot of the Live View screen. You will see an icon in the center of your screen of a camera with a green checkmark. This means the snap has been taken successfully. You can set the snapshot intervals under the Main Menu > Record > Snap menu. Recorded Snaps can later be found in the Main Menu > Search > Image tab. 9. Start/Stop Record – Select to manually start or stop recording video for the selected channel. The default is set to automatically record 24/7. 11. Main Menu – Select to be taken to the Main Menu.